A low budget and quite practical BabyDrive! Mazda is the top selling brand of cars in Australia to private buyers, but I had never driven them. The Mazda3 is a very popular car so I was very keen to give it a test for BabyDrive! I drove the hatch, a compact little car which for its price is actually very good, and there is also a sedan version. 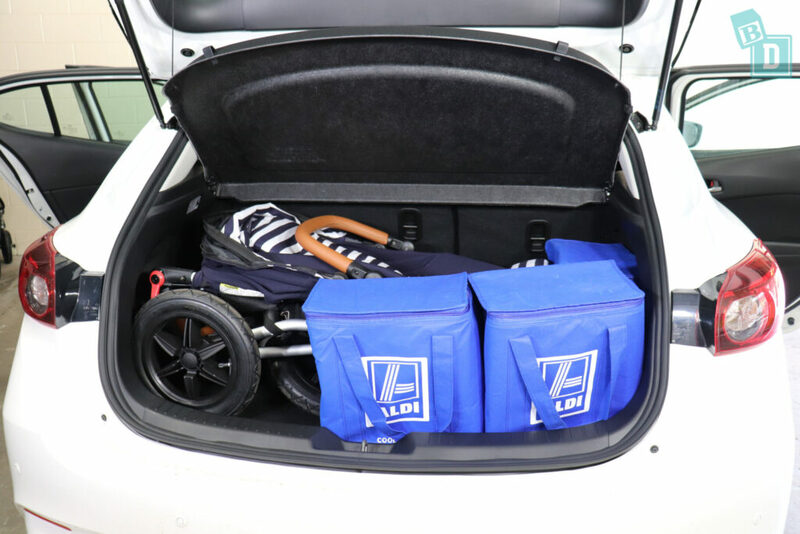 At first glance, I thought the boot's tiny but actually it fitted 11 shopping bags and the all three of the Mountain Buggy strollers fitted with fair amounts of shopping bags around them! I did have to take the rear wheels off the Duet twin stroller but it fitted in which was surprising! Storage inside the cabin was minimal but on the whole, it was very practical and fit for purpose. The two cup holders in the central console were a little big for a disposable or reusable coffee cups but held a large refillable water bottle nicely. The door pockets throughout the car were well-sized for large refillable water bottles and the glove box was big enough to house the manual as well as my wallet and iPad. There is no sunglasses case in the ceiling so the well in front of the gear lever was home to those. I found this was the best spot for my phone as the two USB sockets are there too. 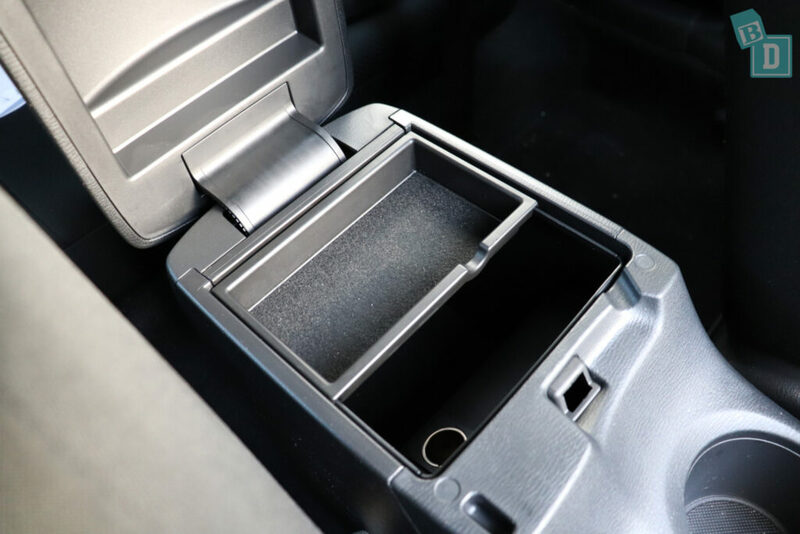 The central console storage box is a good size with a felt lining and a tray in the top that is also good for keeping phones out of sight! In the back, storage is very minimal with just one map pocket that would hold an iPad (but not conceal it) and the good-sized door bins. With rear-facing child seats installed in the two outer positions, I found I could sit in the driver's seat but I am only 164cm, and anyone taller would really have trouble!! There are two ISO Fix in the two outer seats. They are white bars between the seat base and back, and although they are not within plastic guides but their white colour made them really easy to find which was great! The top tethers are across all three rear seat backs and are easily accessible through the boot. They are not labelled but they are easy to connect to. 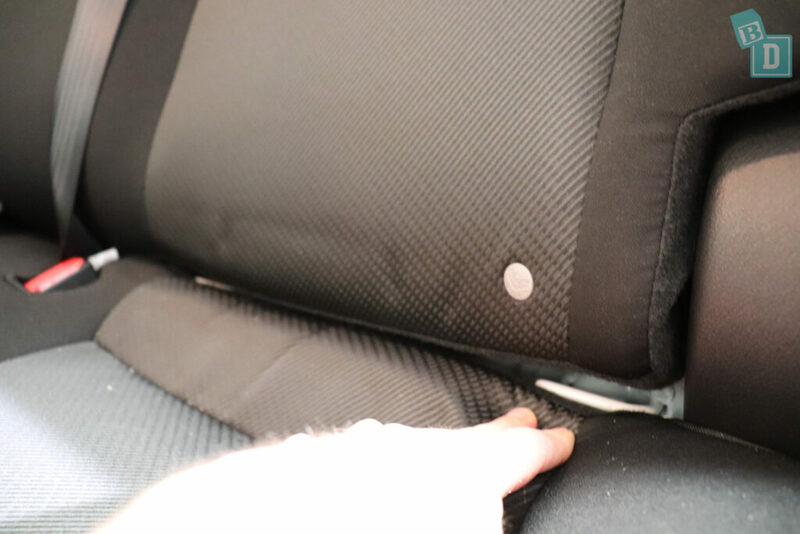 I managed to instal two rear-facing child seats, the Britax Unity infant capsule and the Britax Graphene, in the two outer seats. The rear seat base is quite shaped and I found this prevented me from fitting a third forward-facing seat in the middle of them. I did find, however, that if I only installed the Britax Unity infant capsule rear-facing, I could fit two forward-facing child seats alongside it (the Britax Kid Guard Pro and Maxi Guard Pro)! The Mazda3 was not a particularly noisy car, and the parking sensors could be turned off on the media touch screen. The media system does not have Apple CarPlay or Android Auto and the system does seem a little outdated and difficult to navigate. The image quality is low resolution and I found it a lengthy process to connect my phone to it and get it to start playing Tulsi's nursery rhymes too! 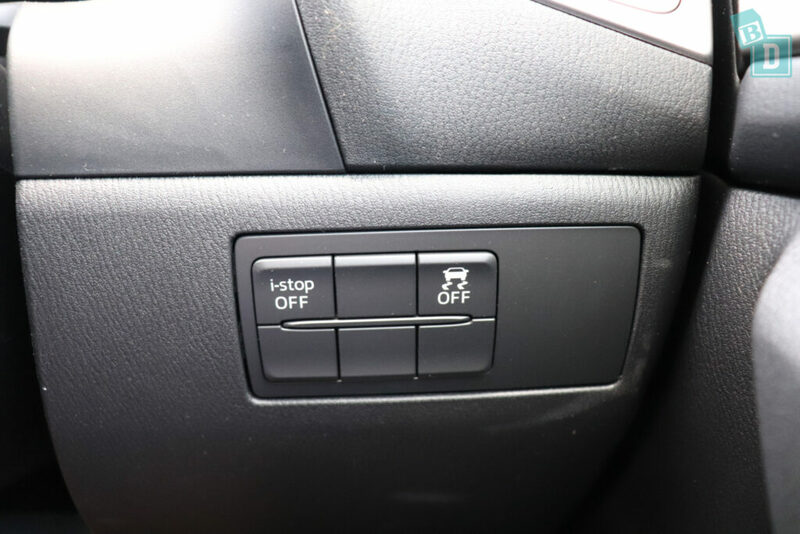 The Mazda i-stop is a fantastic BabyDrive feature allowing you to turn off the auto engine cut out until you turn it back on again. It remembers your setting the next time you drive! I love this feature because it stops you forgetting to turn it off each journey and then only realising when you come to traffic lights and ‘waaah’ bub's crying because the vibrations of the car have stopped!! 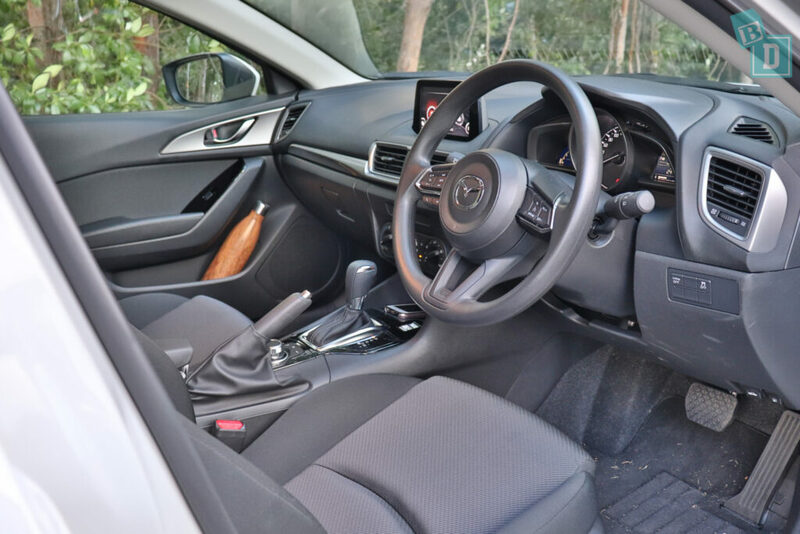 The Mazda3 was a pleasant car to drive, and for its price it is definitely nimble around town and fun to drive on the open roads. It was the base model that I tested, so the seat coverings and aesthetics were not particularly luxurious but for a car of this price, you can't expect it. I did find the seats incredibly uncomfortable and in two weeks could not wait to not have to sit in the uncomfortable driving position any longer! The Mazda3 was given a five-star ANCAP safety rating in 2016 and comes with six airbags as standard. The Mazda3 is a compact little car! We found when our stroller was in the boot that we had to put a lot on the back seats that would normally go in the boot. 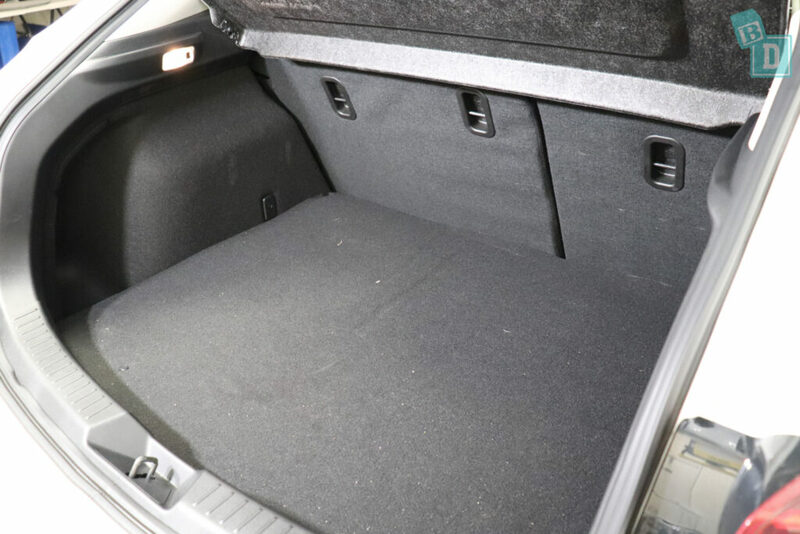 The boot floor is nice and flat with a thin covering over it so you could do a comfortable emergency nappy change. When it was empty the boot would hold 11 shopping bags. The boot space and its functionality are really important. I like to have a big boot space and little side wells or areas I can divide things into. So something I don’t want to move around while I’m driving such as Tulsi’s lunch bag or her wet swimming gear can be sectioned off in a little well where it’s not going to spill or get squashed by the rest of the things in the boot.Hooks for securing shopping bags to are also favourites of mine, I like being able to secure the bag containing more fragile things like eggs so they don’t move around on the journey. I measure the boot space in freezer shopping bags, prams and dogs. Not because I think all there is to a mum’s life is food shopping, prams and dogs (although it can feel like it sometimes!!) But because these are visually measurable items we can all associate with. For me, the car company boot measurement of litres is not an amount I can easily visualise and 400L in one car may differ in usability to that in another due to the configuration or shape of the space. The Mountain Buggy Duet twin stroller only fitted in the boot face down and with the rear wheels removed, but I could fit two shopping bags in with it. The Mountain Buggy Urban Jungle single stroller fitted across the boot with two shopping bags around it. The Mountain Buggy Nano fitted in the boot with seven shopping bags around it. Or with the parcel shelf removed you could carry a small dog in the boot. Inside the cabin, the storage is minimal but functional. 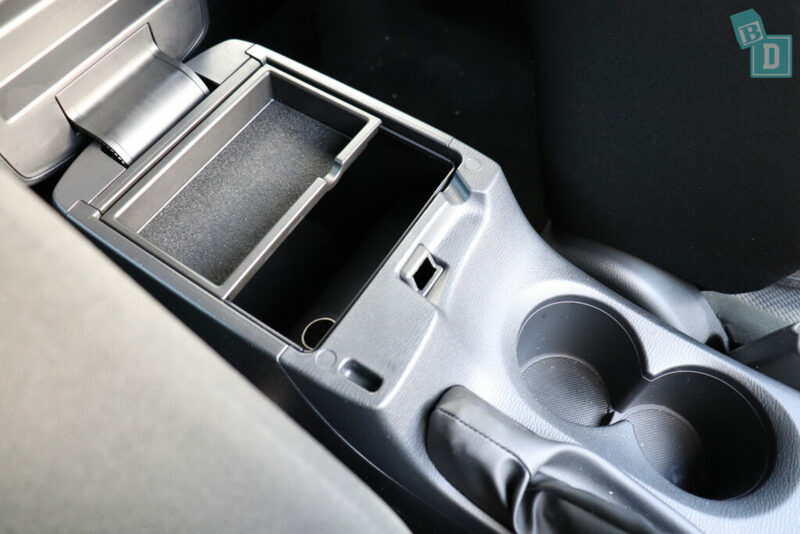 There are two cup holders in the central console that will hold reusable and disposable coffee cups but they rattle around in there. My large refillable water bottle fits in the cup holders too. The door bins will also hold a large refillable water bottle and my wallet fitted in them too, but an iPad didn't fit. There are little storage wells in all the door handles which I find fantastic for putting my keys in whilst loading bub in and out of the car. In front of the gear lever is a little rubber-lined tray that I found best for storing my phone, as above that are two USB ports. There is no sunglasses case in the ceiling so I found this tray was also where I put my glasses and my keys, which is not ideal as the glasses end up getting scratched! 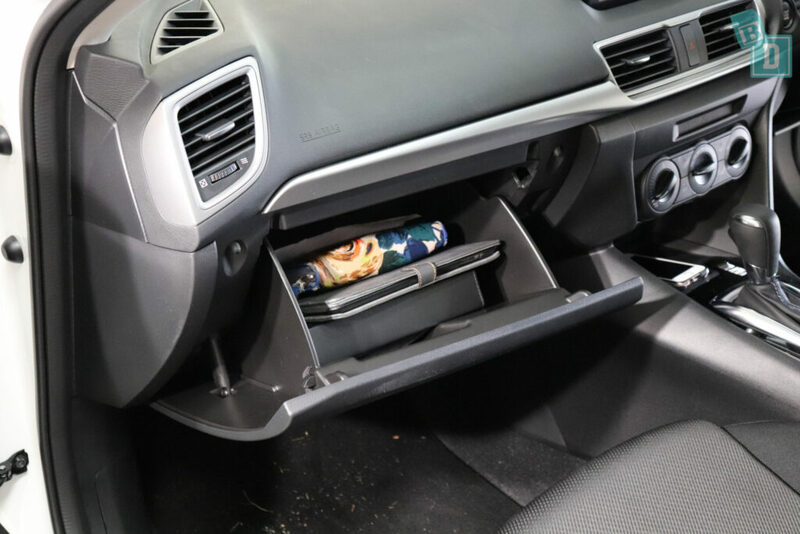 The lid of the central console storage box doubles as your armrest. Inside the storage is quite good, it is felt lined and has a 12V socket inside too. There is a little tray on top that you can put your phone and coins in too. The glovebox appears quite small but it was functional, it would hold my iPad and wallet with the manual and it is felt lined. In the back, storage is minimal, there is just one map pocket in the back of the front passenger seat, it is solid and would hold an iPad. The door bins would hold a large refillable water bottle but there are no cup holders in the back. The parking sensors in the Mazda3 could not be muted but were easy to turn off by pressing the arrow in the top right of the media screen once they are activated. The indicators were not too noisy when bub was asleep and I didn't find they disturbed her at all. The Mazda3 has auto engine cut out, which they call i-stop. There is a switch by your right knee so you can turn it off. The BEST thing about Mazdas is that this is remembered until you turn it back on again!! I find this function really disturbing for sleeping babies, you have just got your baby to sleep in the car and you stop at lights and the engine turns off! Sometimes they will stay asleep but when the engine shudders to a start again it shakes baby awake and all your efforts are ruined!! Even coming to a stop at lights with the engine running can be enough to wake a sleeping child so turning the engine off and on again will definitely do it! I have driven routes I know have roundabouts rather than lights just to avoid coming to a stop for any length of time!! Road and engine noise was not too bad in the Mazda3. There were some hills when the engine was revving quite loudly but apart from that, it made no noises that were disturbing for passengers. Becoming a parent I soon realised there are some noises and sounds I feel are unnecessary and I could happily live without if it meant my baby stayed asleep!! That often the distraction of my screaming, distressed baby is more dangerous when driving than not having a lane departure warning for example. If it is the lane departure warning beeping that creates distress with my baby then which is safest? It’s where I think we need to be able to strike a balance and choose when we can mute the warnings or swap them to a vibration in the steering wheel or flashing light perhaps? A lot of these noises come with the increase in technology and especially linked to safety features and alerts. For me these all have their place. Another thing I have realised is I spend my time in a lot more places where small children roam; parks, beaches, play gyms, swimming lessons, daycare centre etc. I have become more aware that when I’m reversing or manouvering in the car parks I have to tripple check for small children running around behind me or being in my blind spot when reversing. For this I LOVE reversing cameras, I just don’t like their beeping sounds!! I have become so much more aware of safety and potential accidents or hazards since having a child and so I love the peace of mind that I get from the cameras and sensors combined with my own vision from windows and mirrors as I don’t trust cameras alone. The doors and windows opened and closed without disturbing passengers too and you could come to a stop with the engine running and get out of the car without an alarm sounding! The seatbelt removal alarm sounds when a rear seatbelt is removed while the car is being driven and a light display appears on the central dashboard. In the back, there are two ISO Fix points, one in each of the outer seats. They are white bars situated between the seat back and seat base and not within plastic guides. It really helps that they are white because they are easier to locate, which sounds like a small detail but it made a big difference when installing the child seats and I found they easily connected. In the boot, there are three top tether anchor points, one in each of the seat backs. They are not labelled but I found they were easy to connect to and they are within plastic guides. 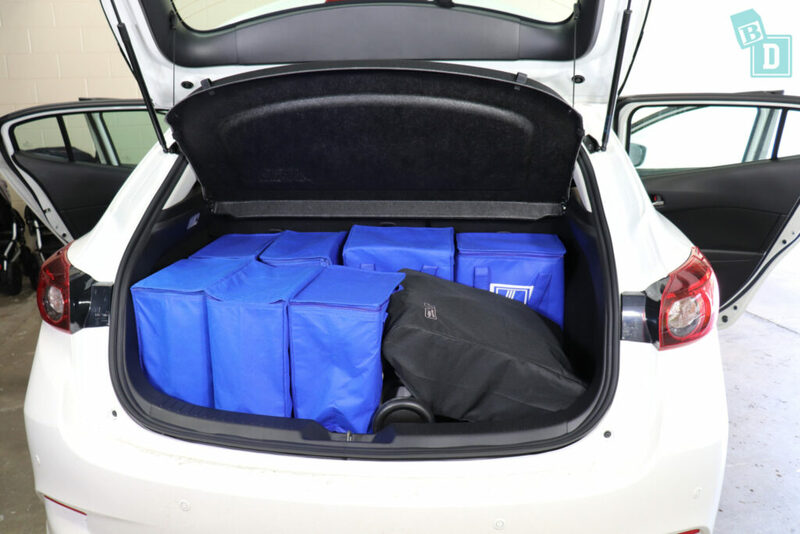 When fitting the child seats I found I could fit two rear-facing child seats in the back, the Britax Graphene and the Britax Unity infant capsule, in each of the outer seats. With these installed I could not squeeze a third child seat in between them. 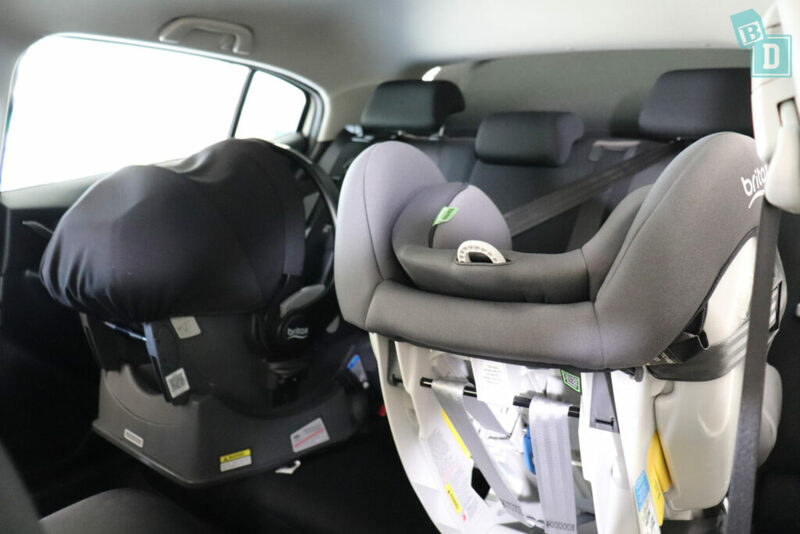 However, I found I could fit three child seats if I used the rear facing Britax Unity infant capsule and two forward-facing child seats, the Britax Maxi Guard Pro forward facing on one side with the Britax Kid Guard Pro booster seat in the central seat. The centre panel of the outer seats is quite sunken and the middle seat base is quite raised and humped so that is why the two rear-facing child seats wouldn't allow for a third, but the forward-facing seats seemed to cope with the undulating surfaces better. I found it really surprising for a little car of this size that it would fit these three big child seats in the back row, it's actually very impressive! The seats are upholstered in a horrible synthetic fabric. It reminded me of the nasty, cheap school uniform or suiting! So it wouldn't clean spills very easily they would get quite ingrained in the weave. There is room to feed bub in the back with only one child seat installed. Posting bub in and out of their child seats from outside the car is actually a little cramped as the doors slope downwards at the back, so you really have to watch their heads (and your own) when posting them in, and also when bending in and out to do up child restraints. When posting bub in and out of their seats from inside the car, there is not much headroom, which just makes it a bit cramped. With rear-facing and forward-facing child seats installed in the back, there is just no legroom in the front at all! It is something we have REALLY struggled with while we have been testing it. With a rear-facing child seat, I could sit in front of it in the driver's seat and I am 162cm but I don't think anyone much taller could! In the passenger seat, my husband who is 184cm, could just sit in front of a forward facing child seat but as you can see, legroom was as bad in the back as it was in the front!! The seats in the front of the Mazda3 grew increasingly uncomfortable as our fortnight with it went on!! I found I just couldn't get them in a good position!?! They were manually adjustable with plastic levers on the side of the chairs which felt flimsy in your hands too. I could not wear a ponytail with the front seat headrests either which was frustrating too! The second row of seats does not slide or adjust for legroom, but the rear seats are not too bad in terms of comfort. The central seat is quite humped so there is not a lot a headroom and the footwell has a large hump you need to straddle with your legs when sitting there too. The steering wheel is fully adjustable in/out and up/down. The cruise control buttons are situated on the steering wheel. They were easy to use but the Mazda3 was not good at keeping to the set speed on undulating roads at low speeds and would easily gain 7km over the set speed on a slight slope. There are four aircon vents across the front of the dashboard, two in the centre and one at either end. There are none in the back so the front ones have to cool the whole cabin and I found they did that adequately. 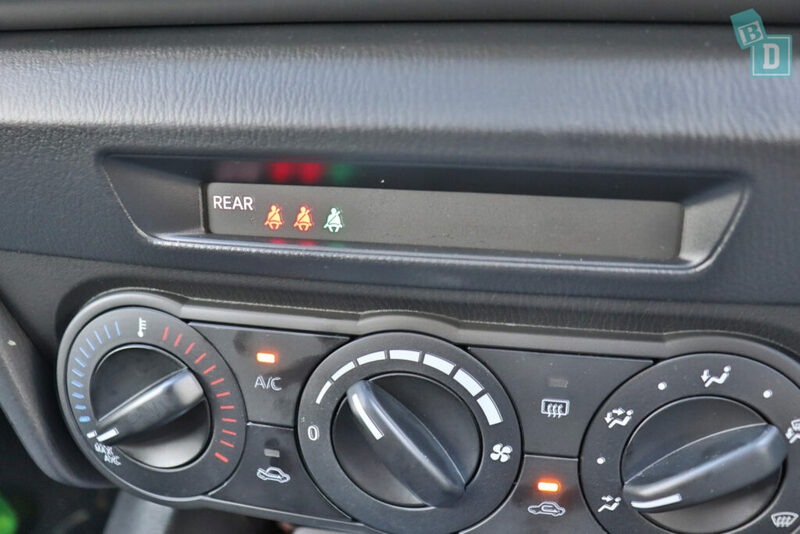 The aircon controls are centrally located on the dashboard and were easy to reach and use while driving. Visibility in the Mazda3 was quite poor out of the back, the rear window was quite small and the rear side windows slope down at the back, which does look very nice on the outside of the car but on the inside it creates blind spots in the back corners, especially when reversing. Also for rear-facing passengers, this has the same effect and I know with my daughter it could mean the difference between screaming for an entire journey or not!! One thing I have noticed since being a mum is I hate it when I reach a destination or get home from being out and Tulsi has either done really well in the car or she is screaming her head off and I have done really well to keep it together for the entire journey (usually the latter!!) and it takes 10 minutes to park the car! It can be really stressful. One test is how easy cars are to park in our tight apartment block carpark, but the Mazda3 although only a small sized car was tricky to reverse park due to the poor visibility and I did rely on the camera! There are vanity mirrors in both front visors, they are not lit though. The Mazda3 wasn't a bad car to drive, it was a bit ‘revvy' up hills but it was nimble around town and fun out on the open roads. Being a small, compact little car it was relatively easy to park using the reversing camera for the blind spots. There are well-positioned handles in the ceiling above both rear doors that would hold a child's toy. The Mazda3 I tested did not have keyless entry or a powered tailgate and I found I did miss them both when I was fumbling around in bags of child STUFF looking for the keys!! The distance to empty was displayed on the dash in front of the steering wheel and I found it very useful as I actually got down to 3km of fuel left when I couldn't get fuel because I was late for a daycare pick up!! A little too close to the wire for me but I was very glad of the display!! The Mazda3 scored a five-star ANCAP safety rating in 2016, getting a total of 36.40 out of 37 overall. For the frontal offset test it got 15.40 out of 16 and 16/16 for the side impact test. It got 2/2 for the pole test and in the pedestrian protection test it was rated acceptable. Six airbags come as standard; there are dual frontal airbags as well as side head and chest airbags for the front and the rear passengers as well. As standard, the Mazda3 comes with anti-lock brakes (ABS), autonomous emergency braking (AEB), electronic brake force distribution (EBD), electronic stability control (ESC), along with emergency brake assist (EBA) and emergency stop signal (ESS), hill launch assist and pre-crash systems.